Spare a thought for the humble real time strategy rifleman. Forever at the bottom of any game’s tech tree, he’s almost always an anonymous early game stop gap unit churned out and slaughtered in the thousands everyday. Faceless, nameless and inevitably out-classed as soon as you unlock better, more advanced units; he’s the whipping boy of the strategy genre. 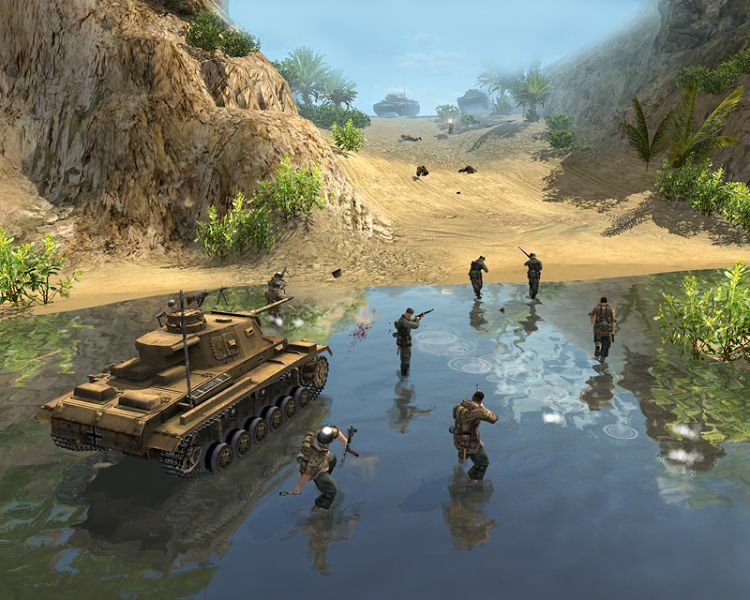 But in Men of War, the latest RTS from Russian developer Best Way, the humble RTS infantryman means business. Here, just as in reality, a correctly positioned and equipped infantryman is the equal for even the toughest armour, resistant to even the heaviest of artillery barrage or fiercest odds. Every soldier not only has an individual name, but an individual inventory, which creates a feeling of personal involvement with your little fighting men that few other games can touch. If a tank rolls too close and your man has an anti-tank grenade to hand he’ll hurl it at the angry metal box on treads all by himself, if he takes a few rounds and has bandages to hand he’ll patch himself up and if he runs out of ammunition (yes, your forces can run out of ammo) he’ll switch weapons or throw grenades. Of course, you can initiate all these actions yourself, but the fact that your men are able to do so of their own accord makes the whole experience feel that much more genuine. But hang on; I’m getting a bit ahead of myself here, so let’s just take a quick step back. The comically bland titled Men of War (it could easily be a History Channel documentary) is, just like its cruelly overlooked predecessor Faces of War, a World War 2 RTS (yes, another one), once again taking us back to the well-trod battlefields of war torn Europe. The difference though is that the game has very clearly been a labour of love on the part of the Russian developer, Best Way; this is no quick throwaway title or futile attempt to topple Company of Heroes. The level of design detail apparent in every facet of the game is nothing short of amazing and the same is true for the inventory system, which extends to every emplacement and vehicle, to the point that tanks can actually run out of fuel. Units have even been accurately modelled right down to the differing thicknesses of armour plating around a tank’s hull turret. It’s an armchair general’s fantasy, with hundreds of different vehicles, weapons and emplacements ready to command, or even commandeer. With the press of a key you’re able to take direct control of any unit under your command, steering with the direction keys and aiming with the mouse, essentially turning the game from an RTS into a third person shooter. The glee of commandeering your only heavy tank or last remaining artillery piece at the peak of a battle and knocking out several approaching German Panzers is huge and only adds to the feeling of involvement in your missions – you’re not just commanding these troops, you’re fighting alongside them! 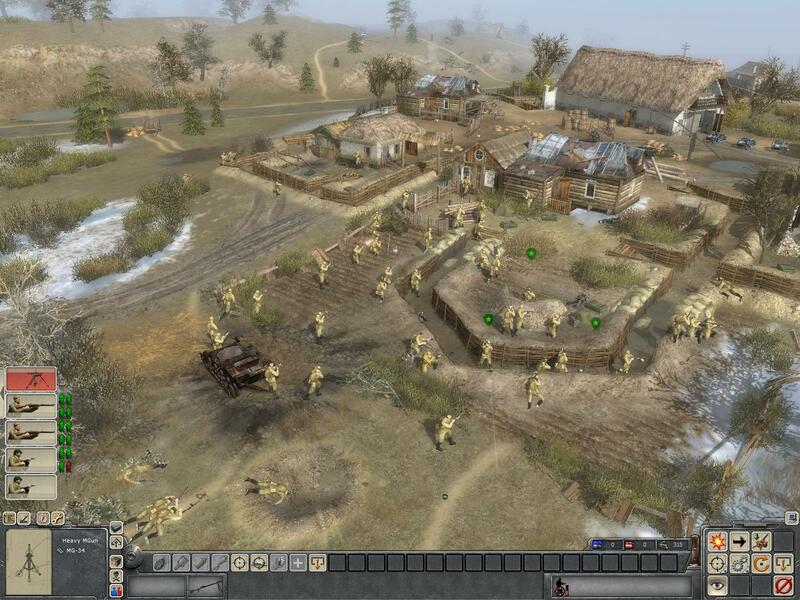 Of course, the unit AI is solid enough to do all this by itself if needed and tanks will automatically switch between high explosive or armour piercing rounds and units will take cover and throw grenades, but the chance to jump in at a crucial point in the battle and make the difference makes Men of War unique among its peers. We take a look at the latest strategy game gunning for DotA's crown.